When run, CardSync will present the main screen. On this screen are four options. Backup Rom Files: When checked, any programs/data stored in the flash using FlashPro will be copied to the memory card. Since Flash memory survives a complete data loss, this is typically not needed. However, it is useful if you will be upgrading your Operating System (which erases the flash files). Alternatively, you can use this option to create a copy of FlashPro files on your memory card, which you can then copy to your desktop PC for safekeeping against loss of your device. Archive old files: If you delete a file on your handheld, CardSync will move the prior backup of the file to an "Archive" directory on your memory card, if this option is selected. Backup Unsaved Preferences: It is recommended by Palm Computing that the "Unsaved Preferences" file not be backed up, since this file is not supposed to contain any information that is needed for any length of time, and the information saved here may be dependent on the machine it is being used on. Having said that, I always use this option, since some programs do put information in this file that should be backed up. (If you find any programs that don't seem to restore completely when this option is not enabled, write to the developer of that application, and ask them to store their data in the "Saved Preferences" file instead!). 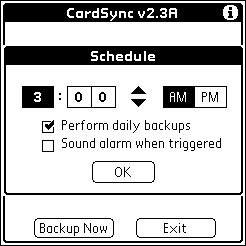 After tapping "Backup Now" on the main screen, CardSync will scan all installed files, and copy files to the memory card as needed. It will then present a screen indicating how many files were backed up and how many were skipped. Files are backed up to the "CardSync Backup" directory on your memory card. Archived files end up in the "CardSync Backup\Archive" directory, and backed up FlashPro files are in the "CardSync Backup\ROM" directory. If you want to keep a particular backup of your device indefinitely, you can just rename the "CardSync Backup" directory to something else. The next time that CardSync runs, it will re-create the necessary directories, and recreate all the backup files in those directories. The contents of your renamed directory will be intact. To access the schedule manager, tap "Menu"/"Schedule". Activate daily backups by checking "Perform Daily Backups". Once activated, you will be able to select the time of the day that you want your daily backups to occur. You can also select "Sound alarm when triggered" to have an audible alarm occur when the backup starts. When the automated backup completes, control of the PDA will be passed back to whatever application was active when the backup started. No summary screen will be presented. 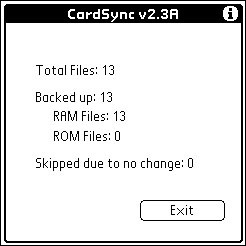 The next time CardSync is run, it will display the date and time of the last backup. CardSync will not allow an alarm to be set that occurs within one minute. In this case, it will schedule the next alarm to occur in 24 hours. CardSync will attempt to disable the AutoCF interface temporarily while backing up. If it is unable to do this successfully, the backup will not occur, and CardSync will provide a warning that the backup was skipped. To avoid this, ensure that no card-aware applications have data files open on the memory card when the backup is triggered. The restore command is activated by tapping "Menu" and then "Restore". If CardSync is used to restore your device, it will attempt to overwrite all databases installed on the device with copies that CardSync backed up. The restore command can be chosen whether or not you have suffered a complete data loss. If conflicts are found, CardSync will (by default) attempt to replace any existing files with copies from the CardSync backup directory. A warning message will be provided for any files that were not successfully copied to the device. (Note: It is common for an error to occur while copying the Net_Prefs.PRC file. This is normal). 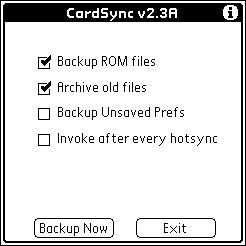 After the restore command, CardSync will set your user name and hotsync ID to the settings saved during the last backup. This will ensure that your device will be properly associated with the appropriate one on your PC during the next hotsync. When complete, your device will require a soft reset. After this reset, your device should be in the same condition it was as of the last reset. Subsequent hotsyncs will operate as expected. The desktop PC will not even be aware that a data loss/restore occurred. 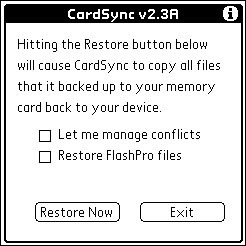 If you are restoring FlashPro files, CardSync will check that you have a supported combination of FlashPro. FlashPro 1.08/1.09 can not be used to do a restore if you are using OS 3.5. FlashPro 1.09a is required. Use the appropriate OS tool to copy the contents of the "CardSync Backup" directory to RAM. Once complete, the user name on your device will not be restored. This method can be used to selectively restore files. Note that if you do this, you might want to rename your "CardSync Backup" directory, since it will be recreated the next time CardSync is run. Note that some applications choose to store some information in the "Unsaved Preferences" file. This file may not be backed up, depending on how CardSync was configured when the backup ran. Palm Computing recommends that this file not be backed up. If this file is not restored to the device, some minor configuration changes may be lost after a restore. There are no reported problems with using CardSync to back-up the "Unsaved Preferences" file. Just install the single CardSync.prc file to your device. Run it and set the options on the main screen. Select the "Schedule" option from the drop down menu to enable scheduled backups. If you are upgrading, just install the new CardSync over top of the old one. To uninstall CardSync, delete it from your handheld. Then use the appropriate OS tool to delete the "\CardSync backup" (and all subdirectories) from your memory card. "I/O Error getting the working directory"
"File not found changing directories"
Neither of these fixes may be satisfactory to you. TRG is rumoured to be developing a ScanDisk that will run on their handheld devices. Check their web site for an update if the other options are not ideal solutions for you. CardSync requires about 100k of free RAM to operate. Also, it requires slightly morespace on your memory card as you have used in RAM. For example, if you have used 5800k of RAM, your "CardSync Backup" directory may end up using 6100k of space on your memory card.